This is my take on fried shrimp tempura. In the original recipe it’s with a light batter that’s very airy when fried. It’s a nice dish but it always seemed a little bland to me. I upgraded the recipe by marinating the shrimp before cooking it. The marinade accentuates the taste of the shrimp, while the thicker batter with Japanese Panko bread crumbs creates a great, very crispy outer shell. Peel the shrimps but let the tails attached. Make three small cuts in each shrimp, one in the middle and one on each side. This prevents the shrimps from curling up when you cook them. Put the bowl with the marinade and shrimps in the refrigerator. The cold inhibits bacterial growth. Let the shrimps absorb the juices for at least two hours. Put 100 g of tempura batter mix in a glass bowl and mix it with 160 ml of cold water. Sprinkle 50 g of Panko bread crumbs (or more, depending on the number of shrimps) on a plate. Dip the marinated shrimps one by one in the batter, then roll them in the Panko bread crumbs. As soon as the shrimps are covered in the bread crumbs, put them in the deep fryer. Fry only three or four shrimps at a time to better control the frying process. Deep fry until golden brown. If you are not sure if the shrimps are fully fried, simply cut one in half and check if it’s fried inside. Let the fried shrimps cool on a paper towel. The paper absorbs excess fat. 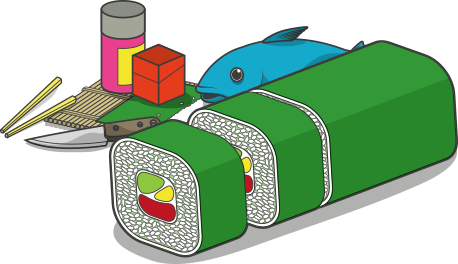 Use the shrimp tempura for a sushi roll, for instance the pink salmon sushi roll. You can also eat these delicious shrimp tempura on their own. In that case I highly recommend eating them with Okonomiyaki dipping sauce. 1 tablespoon soy sauceMix together. Optionally add honey to your liking. Mix everything together. Done!